Years of the Rooster: 1933 – 1945 – 1957 – 1969 – 1981 – 1993 – 2005 – 2017. 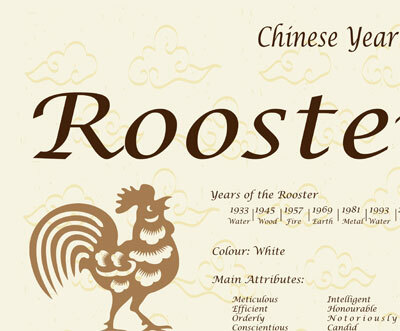 Roosters are the most eccentric of the Chinese zodiac. They are full of dreams and romantic ideas. They are colourful and attractive, radiant and dashing, and they are quite proud of themselves. Roosters are organized, precise, and their sharp eyes seek out fine details in everything. They are perfectionists and leave no room for human error. To Roosters, a difficult task is a challenge. They dearly love starting controversies. 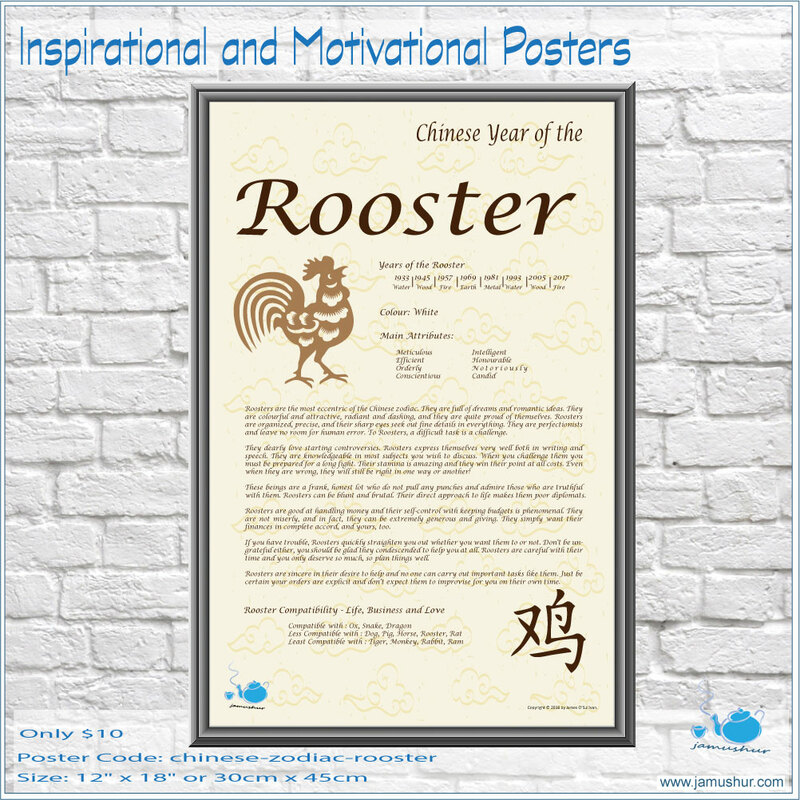 Roosters express themselves very well both in writing and speech. They are knowledgeable in most subjects you wish to discuss. When you challenge them you must be prepared for a long fight. Their stamina is amazing and they win their point at all costs. Even when they are wrong, they will still be right in one way or another! These beings are a frank, honest lot who do not pull any punches and admire those who are truthful with them. Roosters can be blunt and brutal. Their direct approach to life makes them poor diplomats. Roosters are good at handling money and their self-control with keeping budgets is phenomenal. They are not miserly, and in fact, they can be extremely generous and giving. They simply want their finances in complete accord, and yours, too. If you have trouble, Roosters quickly straighten you out whether you want them to or not. Don’t be ungrateful either, you should be glad they condescended to help you at all. Roosters are careful with their time and you only deserve so much, so plan things well. 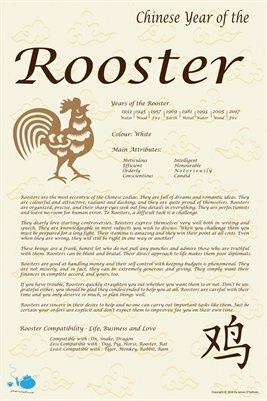 Roosters are sincere in their desire to help and no one can carry out important tasks like them. Just be certain your orders are explicit and don’t expect them to improvise for you on their own time.